A digital transformation process implies the implementation of newest technologies, upgrading of infrastructure, and the use of new software. This is where the primary concern arises: are these technologies and software of the highest quality possible? After all, any faulty software can adversely impact any company’s performance and reputation. Therefore, software testing should play a key role in the transformation process. Quality Assurance and Software Testing are indispensable to ensure that all potential defects are rectified, and the software is of high quality and “polished”. To guarantee that software runs smoothly and that it is reliable and usable it needs to be comprehensively and thoroughly tested by a certified and expert software test engineers. The best option is to engage an independent and unbiased testing team in fulfilling this task. Independent testers often have deep understandingand expertise in a specific product-related industry. 21+ years in the market. 30+ highly skilled and expert testers (90% are ISTQB certified). Our quality assurance system is based on Level 4 of the Capability Maturity Model Integration (CMMI) and conforms to ISO 9001:2008. We act as independent software testing experts who will not be silent about any slightest possible deficiency discovered in the software under test. Iterative Test Methodology applied helps save up to 40% of your budget. We use proven methodologies and techniques to increase quality, reduce cost, and drive improvement. We perform software testing for all types of companies: from startups to mature enterprises. We choose the optimum Testing Strategy as per the particular project’s needs. Our Team members are experienced in working in mixed teams (both developers and testers). Test results are presented to our clients in the form of an accurate and voluminous evaluation report with a list of clear recommendations. IT Awards Jury Board selected Alexandra among other testing specialists for her numerous achievements and outstanding expertise in quality assurance field. The Softengi’s Testing Team is composed of 30+ highly skilled testers, 90% of whom are ISTQB certified. All testers have a vast experience in conducting comprehensive testing of various types of software for clients from different industries. They are always abreast of the latest trends and developments in software testing and innovative technologies. Our existing and new testers have an opportunity to attend courses at our on-site Softengi Training Center. They never stop learning. 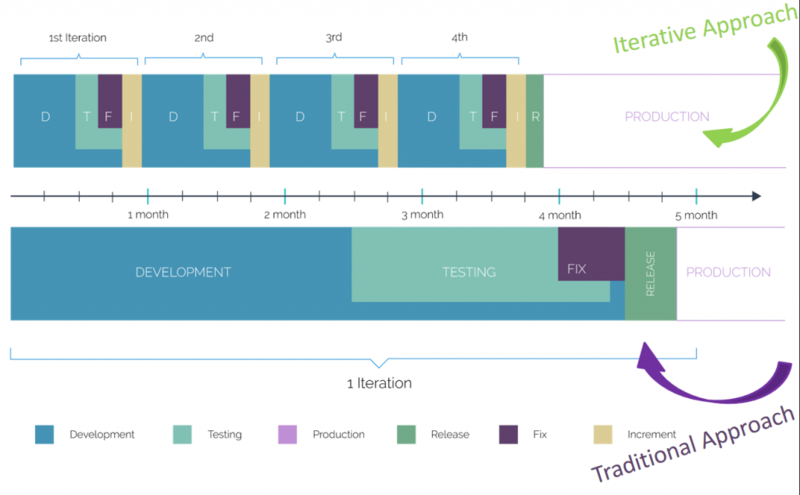 The specificity of Iterative Test Methodology we use is that testing of software is done in iterations throughout the SDLC, whereas under a traditional test methodology testing is a separate process taking place only after the development phase (see Picture 1). Timely detection and resolution of defects. Accurate estimation of the product. Want to check whether your own software is of high quality? Complete contact form to receive a consultation of one of our specialists. If you want to receive a consultation on Independent Software Testing, please complete this form to contact one of our specialists.